On February 25, MCC signed a strategic cooperation framework agreement with the People's Government of Meishan Municipality in Beijing. 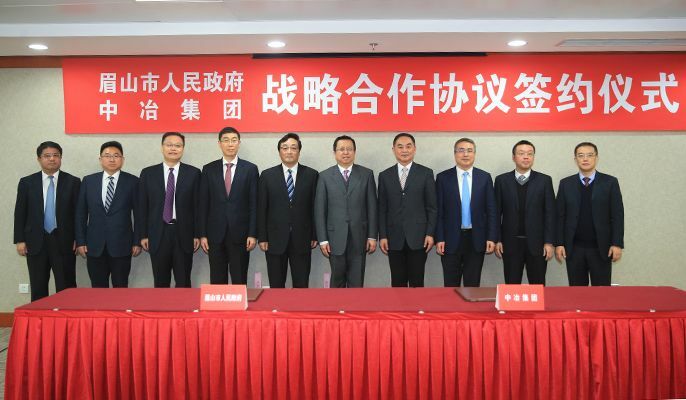 Zhang Zhaoxiang, Vice General Manager and a member of party leadership group of China Minmetals, and Secretary of the Party Committee of MCC and China MCC and General Manager of MCC, and Mu Xinhai, Secretary of Meishan Municipal Party Committee, attended the signing ceremony and delivered speeches. Zhang Mengxing, Deputy Party Secretary of MCC and China MCC and President of China MCC, presided over the signing ceremony. Wang Shilei, Deputy Secretary of Party Committee of MCC and China MCC and Vice President of China MCC, Huang Jiandong, Deputy Secretary of Meishan Municipal Party Committee and Secretary of Meishan Party Working Committee of Sichuan Tianfu New Area, signed the strategic cooperation framework agreement on behalf of the two parties. In his speech, Zhang Zhaoxiang noted that as a Global Fortune 500 enterprise, MCC is the largest, strongest, and best metallurgical engineering construction contractor and metallurgical enterprise operation service provider across the globe. With strong expertise accumulated over the 70-plus years, systematic integration and creative transformation, and innovative development capability, MCC has successfully reshaped itself and is well on its way to becoming "a national leader of metallurgical construction, a backbone of fundamental construction, and a pioneer of emerging industries". Enjoying prime location, Meishan is located in the southwest of Sichuan Basin, a wonderful place billed as "the Land of Abundance". Blessed with rich culture, diverse natural resources, and well-built transport facilities, Meishan is a land with unique charm. In recent years, under the overall planning of Sichuan Provincial Party Committee and the People's Government of Sichuan Province and the leadership of Meishan Municipal Committee and the People's Government of Meishan Municipality, Meishan has scaled new heights and made new leap forward in its social and economic development with fast speed and passion. With the sustained, in-depth implementation of the Belt and Road, Yangtze River Economic Zone, and other national strategies, and the launch of Tianfu New Area and other key projects, Meishan is bound to enjoy a more promising future. Zhang Zhaoxiang said that, MCC has maintained long-term, close cooperation with Meishan City, with CISDI, MCC5 Group, China 19th Metallurgical Corporation and other subsidiaries taking roots in Sichuan. They are making active efforts to participate in the regional economy of Sichuan Province, contributing to local economy while growing themselves at a fast pace. The signing of the cooperation agreement signifies a new starting point of MCC and the People's Government of Meishan Municipality as they seek to further deepen their strategic cooperation, and a strategic move to complement each other's advantages and realize win-win. MCC will fully leverage on its strength in technology, management, talent, and other aspects, and engage in deep cooperation with the People's Government of Meishan Municipality in transportation and municipal infrastructure, urban underground integrated pipe gallery, new-type urbanization, ecological and environmental management, and other fields. MCC will remain true to its spirit of "No work should be delayed for even one day" and work to deliver quality, high-standard projects featuring the value of "MCC builds a better world with strong commitment". It will work to make greater contributions for the quality social and economic development of Meishan and for the building of "an open, pilot city around Chengdu Economic Circle". In his speech, Mu Xinhai said that Meishan, called Meizhou in ancient times and the hometown of literary giant Su Dongpo, is an important part of national Tianfu New Area. In recent years, Chengdu Municipal Committee and the People's Government of Chengdu Municipality have followed the strategy of "open leadership", and worked hard to promote reform, innovation and development through openness. As such, a host of top-notch projects have been brought in. They have also signed strategic cooperation agreement with The University of Hong Kong, Sichuan University, Beijing Foreign Studies University and other prestigious universities. Meishan is second only to Chengdu in Sichuan Province when it comes to the number of Global Fortune 500 enterprises settled down locally. Today, Meishan has become the most dynamic opening-up pacesetter and an investment magnet with huge potential and enormous business opportunities. As a super-sized conglomerate in China, MCC is the largest metallurgical construction contractor and metallurgical enterprise operation service provider in the world, the largest metal structure producer in China, and a national leader of metallurgical construction and a backbone of infrastructure construction. Mu Xinhai pointed out that, at the Third Plenary Session of the Eleventh Session of Sichuan Provincial Committee, Meishan was trusted with the mission of building "an open, pilot city around Chengdu Economic Circle", seeking to make breakthroughs in Chengdu-Meishan integration and other major tasks. As such, Meishan is now facing development opportunities never seen before. It is imperative to introduce MCC and other large enterprises and groups to participate in the development programs of Meishan. We sincerely hope that we can take the strategic cooperation as opportunity to establish bilateral high-level mutual visit, joint conference, and other working mechanisms, further deepen our practical cooperation in transportation and municipal infrastructure construction, comprehensive construction of urban area, building of new-type cities, major project construction, environment protection, and other fields. That is how we will build a better future. We promise to be unswerving in shaping a first-class business environment, working to offer better, quality, convenient services for enterprises in Meishan, and seeking win-win and common development. Before the signing ceremony, Zhang Zhaoxiang and Mu Xinhai had an amicable meeting, where they exchanged views on further strengthening all-dimensional bilateral cooperation and reached to consensus. Other leaders who also participated in the meeting and attended the signing ceremony included: Huang Jiandong, Deputy Secretary of Meishan Municipal Party Committee and Secretary of Meishan Party Working Committee of Sichuan Tianfu New Area, Li Xingqian, a member of the Standing Committee of Meishan Municipal Committee, Deputy Mayor of Meishan Municipal Government, and Deputy Secretary of Meishan Party Working Committee of Sichuan Tianfu New Area, Lai Gang, Director General of Meishan Economic Cooperation Bureau, Wang Shilei, Deputy Secretary of Party Committee of MCC and China MCC and Vice President of China MCC, and other relevant persons, such as Pan Biyi, Yu Chaohui, Wang Hongbo, Wang Wei, Yang Kui, Li Chengjian.